Hey everyone! This has been awhile coming, I just got really busy with university. I first saw this tag when Tanya of Read. Run. Study. did it, I’ll leave the link for her over HERE so you can go check her out, and it looked like a lot of fun so I have decided to attempt it! 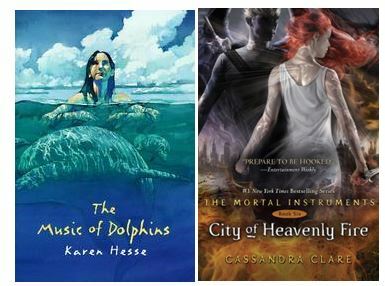 The Music of Dolphins by Karen Hesse is one of the first books that I recall personally buying when I was in grade…3? I have older books in my house but either I didn’t buy them they were given to me or they aren’t mine (ie: all the Harry Potter’s are my older brother’s). City of Heavenly Fire by Cassandra Clare finally shipped to me a few days ago even though I purchased it back whenever, but I’m going to go with that one! My copy of Specials by Scott Westerfeld was in the free book give away bin at my school library so that would be the cheapest. 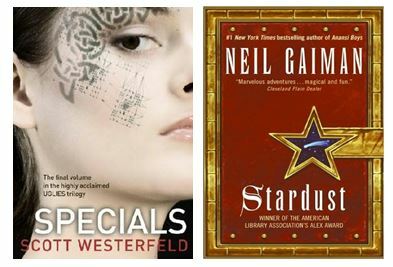 And Stardust by Neil Gaiman is one of my more expensive books at ~$25. Worth it, it’s a really good book, I recommend it! 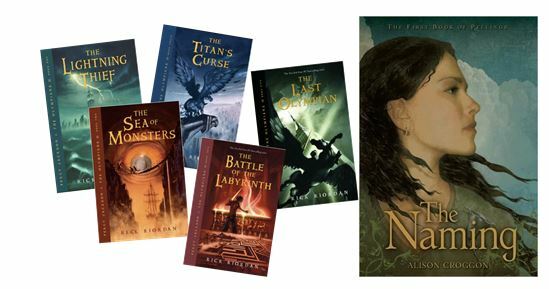 Percy Jackson Series. As I was doing this I realized most of my books don’t have male leads, slightly more challenging then it should have been. 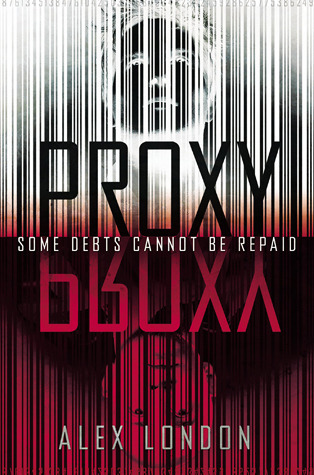 If you haven’t read this series, where have you been for the past 10 years? It’s really amazing, really fun, go find it! Female protagonist! I got this one in the bag! But let’s go with The Naming by Alison Croggon, I have never heard anyone talk about these books, I have two I believe there are four in total. 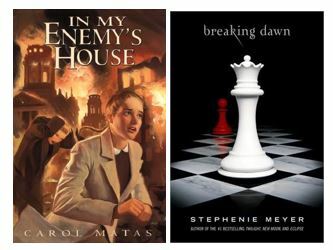 I read these back when I was in my Lord of the Rings mourning period and I really enjoyed them! It’s an epic fantasy that follows a slave girl, Maerad, as she is broken out of her slavery by a magician, Cadvan. I actually have been meaning to pick this series up again and finish it, I only stopped becasue the third book wasn’t published and I just ended up forgetting about it. 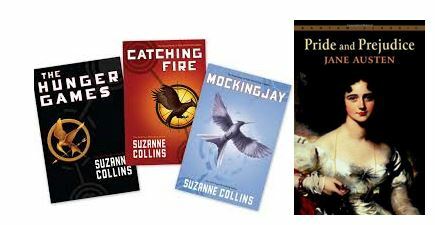 I read the whole Hunger Games Trilogy (by Suzanne Collins) in one night, not ashamed! Who needs sleep when there are books? Pride and Prejudice by Jane Austin. This isn’t a long book! My copy is 275 pages. I was stuck on an island with no TV and no internet and this was the only novel I had left of the ones I brought and it still took me a week! I found this book so boring I kept having the problem of falling asleep while reading it! I keep telling myself that I should re-read it becasue I was pretty young, 12 or so, and I’ll probably enjoy it more now but it’s really hard to force myself to do. Entwined by Heather Dixon. I feel like i should frame this and hang it as art because it is so beautiful I usually tend to prefer simpler cover designs, but this is just too pretty and it matches the story PERFECTLY! I don’t even own this book but I have to include it, Shatter Me by Tahereh Mafi. I have been avoiding buying this book though I have the other two for no reason other than I hope they re-print the hardcover with the new version. Hasn’t happened yet, but I’m waiting! If I hadn’t heard about this book from so many people liking it and saying the cover doesn’t match, there is no way I would have picked it up. 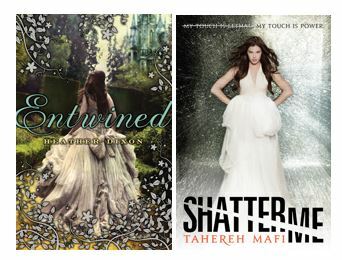 I judge book by their covers, so do you, don’t pretend you don’t. When you are out walking though Chapters or Barnes and Noble you don’t pick up books that don’t catch your eye. 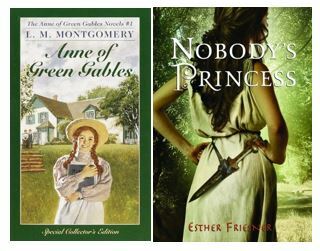 The only book I have based in Canada is Anne of Green Gables by Lucy Maud Montgomery. If you don’t know this book and you are female I’m not sure what to say to you. There are a bunch of movie and TV movies and TV shows and there’s a musical. Classic young girl literature. I’m going to go with Greece becasue I was just there, Nobody’s Princess by Esther Friesner, it’s based in ancient Greece and follows Helen of Troy when she was a child. Not a fantastic book, the history and mythology isn’t overly researched, but it’s kinda cute. Little bit of badassery from 10-year-old Helen. The thinnest book I have is In My Enemies House by Carol Matas clocking in at only 176 pages. This is a WW2 book and it is very intense, I can not read it more than once every couple years becasue even though it is fantastic, it’s very graphic and difficult to read. It’s on par with Elizabeth Wein’s novels in my mind. Breaking Dawn is my thickest at 756 pages unless we count my Charles Dickens collection which is actually 5 books in one and 1481 pages. I haven’t read any of it. It’s really big and scary. It’s absolutely gorgeous though. Thanks to U of C common reading program I own one non-fiction book now. 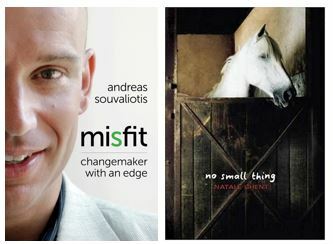 Misfit: A Changemaker with an Edge by Andreas Souvaliotis. I haven’t read it, I probably won’t. I don’t like non-fiction novels. I don’t want to read about this world, that’s what news is for, I want my novels to be an escape. Fiction, let’s have No Small Thing by Natale Ghent becasue I just read it. This book is based in 1977 and is about these three kids for a recently poor family with a father who walked out on them when they lost their money. And they come into a free pony. It’s a super sweet coming of age story. 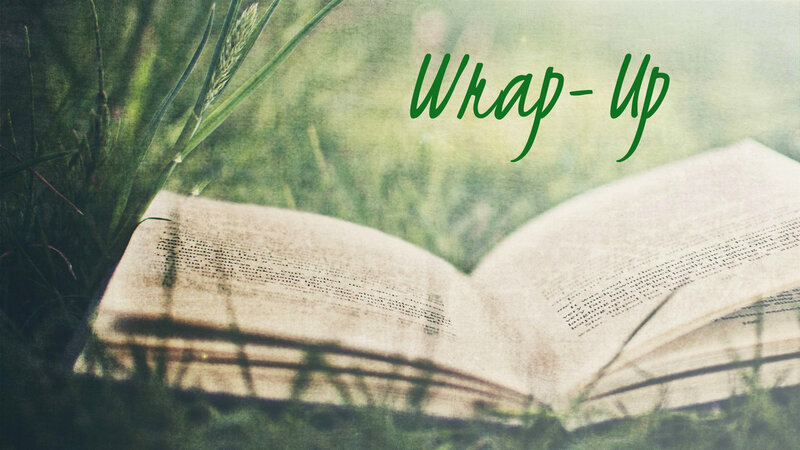 Anyone who has been following my blog for any amount of time knows my go-to romantic novel but I’m going to shake it up a bit and actually do something different. Halo by Alexandra Adoretto. This novel is about 3 angels who come to earth and the youngest one falls in love with a human boy. This is another book I didn’t realize was a series. It ended perfectly fine after this book and I don’t see the reason for a second so I haven’t read it becasue I’m sure that somehow it will mess up this perfect novel. It’s not all lovey-dovey, there is some conflict with a demon pretending to be human and bringing evil to the town and what-not. I could have gone more romantic but I don’t read many romance specific books. I like my books with romance in them but I don’t own many “romance novels.” I’ve read some, none that come to mind. If you want to leave some suggestions that would be nice actually.I need some fluff to read. 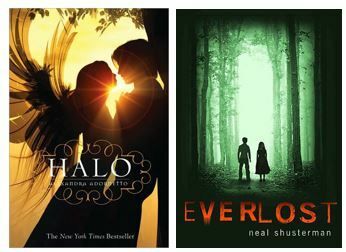 Everlost by Neal Shusterman. I didn’t realize this was a series until I just Goodreads it to find the authors name! Apparently it’s a trilogy. It’s about kids caught in limbo, really interesting. There’s a hint near the end that there might be a romance starting but we never see it develop which was fine by me, the story wasn’t set up for a romance. Hurt Go Happy by Ginny Rorby. This is a weird one becasue while reading it you wouldn’t immediately think “happy.” It has a lot of sad moment in it and the end is incredibly bitter-sweet. I wish I could explain it better but that would spoil you. It’s so hopeful and optimistic it makes me feel better. 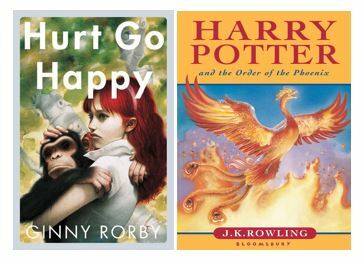 Harry Potter and the Order of the Phoenix by JK Rowling. ***SPOILERS*** Many will disagree with me becasue this is a touchy subject, but the hardest death for me in this series was Sirius Black. He didn’t need to die, if Harry had just remembered his stupid mirror! He was the best person and he went through so much and just as his life was improving he gets killed. That is it for this tag! I hope you found some new books you want to pick up! Hello darlings! Summer is over and my first official day of university is tomorrow! I’m back from Greece, which was absolutely amazing I saw and did a lot of very, very cool things but it’s nice to be home again. I think I did okay considering I was away and not really reading for two weeks! I’ll talk to you guys later! Kisses! 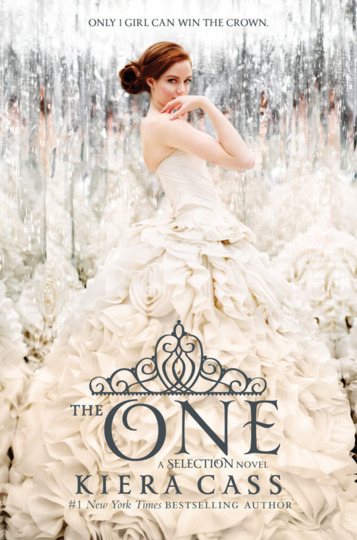 Hey friendship who has read The One. How are you? I hated America considerably less in this book. She could still be infuriating especially with the whole Aspen stupid situation and her indecisiveness on everything and her insane ill-planned actions but it wasn’t nearly as frustrating as in The Elite. He stupidest moment had to be the leaving the castle in the dead of night to meet with August and exchange 10 words. 20 tops. What the hell is wrong with notes? Coded message? Carrier pigeon? Smoke signals, anything but endangering the two people you need alive! Kriss and America’s father being northern rebels had to be the least shocking thing ever. I’m not entirely sure why it was even necessary to include. Anyway, America gets shot and we end up in Aspen’s room of all places with all America’s love letters posted all over the walls! Am I the only one finding these shrines to America weird? Maxon has his pictures, Aspen has letters, it just seems weird to me. I don’t think I’d find a wall for pictures of me sweet. I loved when America was talking to her dad and explaining why she liked Maxon and he made her feel like herself, not a number or a project. We knew even in The Selection that America was going to be Queen so it felt really dragged out at time! All she needs to do is say “Oh, I love you” she has this epiphany halfway through where they are on the roof dancing in the rain of she loves Maxon and doesn’t want to be with anyone else but she doesn’t tell him! America is such a horrible procrastinator! I’ll tell him I love him later, I’ll tell him about Aspen later. As soon as he noted that she was close to Aspen (which was AFTER she decided she was so in love with Maxon and wanted to be the princess) I would have been “oh this is actually something we should clear up now so there is no drama later, he and I were childhood sweethearts, it was over by the time I selected and he left to become a guard.” Nice and simple. 80% honest, leave out the make-out sessions in the castle so you both don’t get killed, leave it at the we broke up before I even knew I was selected. But no. We get Maxon at the end suddenly acting irrational and very much like America becasue she was standing close to Aspen. They weren’t even doing anything and he just freaks out. He had to get shot to realize he truly loved her and she loved him. These two are the most dysfunctional couple ever. What I wanted to happen that didn’t really get shown was for the country to start getting fixed. This series truly just was about the selection. I would have rathered the selection be over half way through the second book and then the rest be world fixing. And more back story would have been nice becasue we don’t really know what happened to dissolve America (Country) and make Illea. Celeste! We finally like her in this book! She becomes our best ally and redeems herself. We have these two really fantastic moments with all the elite girls, one when they are fooling around and take Maxon’s camera and are taking a bunch of pictures with the Queen and then when they are all sitting in America’s room having a huge heart-to-heart about what they’re done so far, what they’d do different and their futures and all that. Both of those were so great. And then she dies. It was this huge invasion and in all the past ones no one dies or was even that hurt and this one is just a slaughter! The King conveniently dies, as does Anne (becasue can’t have her complicating he Lucy-Aspen relationship *eyeroll*) and the Queen. And the northerners come in to save the day and we skip right to the wedding. Aspen walking America down the aisle seemed odd. A chapter before Maxon had been shouting at America and ready to marry someone else becasue she was standing close to him and he now knows that he’s her ex-fiance. I would have thought her Mom would give her away, but whatever, it was a satisfying ending.